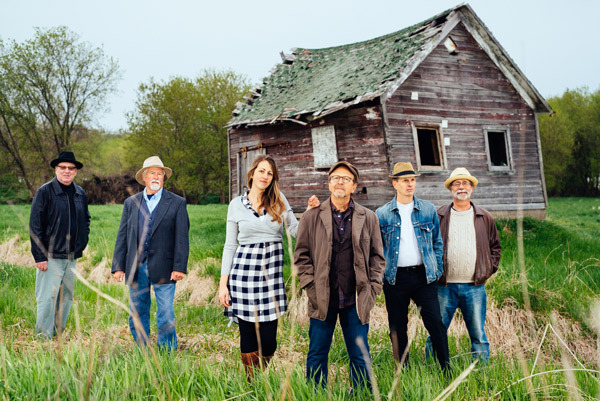 The Hired Hands Band is an six-member band from the Kalamazoo area. Members include (left to right) Willy T. Rose, Bill Hughes, Laura Allison, Bob Allison, Tim Cooper and Dale Hein. Dale, Bill, and Bob founded the band in 2010, originally under the name “Hein, Hughes, & Allison.” Several months later, Tim and Willy T. joined the group and, shortly thereafter, the name was changed to “The Hired Hands.” Laura, Bob’s daughter, has always made special appearances with her Dad on-stage, but she officially joined the Hired Hands in 2015. The Hired Hands perform a variety of original material and cover songs from roads less traveled than the popular music media. The repertoire includes plenty of familiar favorites by the likes of Van Morrison, Bob Dylan, Neil Young, and the Allman Brothers; however, the HHB plays just as many songs by lesser-known artists, like Eric Bibb, Josh Ritter, Wilco, and The Decemberists. Whether a particular song is familiar or not, you will find that the Hired Hands give it their own signature style. Bob plays guitar and is the unmistakable voice of the Hired Hands. He has played strummed and sung with a wide variety of Country/Rock and Bluegrass bands in Michigan, most notably Heartland. Later, as a member of the Moody Coyotes, Bob demonstrated an affinity for singer-songwriters of the Folk and Country traditions, an interest that is wonderfully compatible with the Hired Hands repertoire! Laura, Bob’s daughter, learned to sing around the campfire. She was heavily influenced by her Dad’s taste in music. About the time Bob, Dale, and Bill were forming the band that would evolve into the Hired Hands, Laura was singing harmonies for an Alt-Country band in Chicago, called the New 65’s. After sitting in with the Hired Hands here and there for a few years, she decided to formally join in 2015. 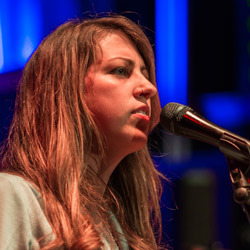 Her beautiful voice and contributions on the banjo have added new dimensions to the band. 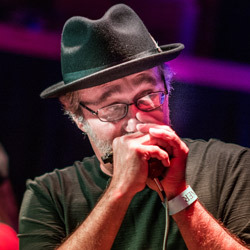 Dale Hein plays harmonica (more commonly called "harp" in some circles) and also sings in a variety of Bluesy styles. 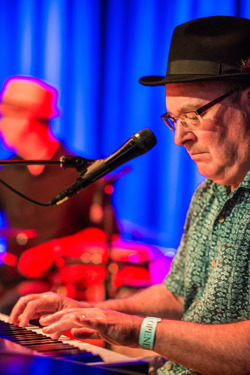 Like Bill, Dale is heavily steeped in the Blues – he has played with variety of Blues bands in the Kalamazoo area. 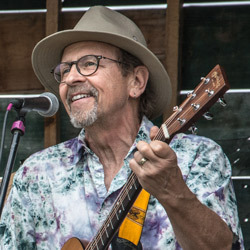 In 2009, Dale ended a 9-year stint with the Blue Moon Blues Band. Born and raised in the St. Louis area, Dale attended college in Ohio, where he picked up the harp and learned to play the Blues. He moved to Kalamazoo in the mid 70's to pursue a graduate degree at Western Michigan University. During this period, Dale owned and operated a used record shop in the downtown area, which explains his massive vinyl record and CD collection, as well as his wide-ranging taste in music. "T" as he is affectionally known to his band mates, plays a fine, Blues and Boogie Woogie-style piano. 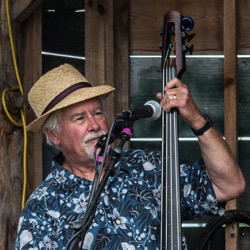 Proficient in multiple "roots" traditions, including Country, Swing, Bluegrass, Old Timey, and Irish, his presence adds some special sauce and authenticity to the Hired Hands' rootsy flavor. And oh yeah ... did we mention this guy can sing? Willy T. can also belt out some fine Jump Blues vocals as well. Mr. Rose lives up yonder in the "North Country," and often travels a great distance to play with the Hired Hands. When he does, his joyful sound benefits everyone in the room – the band, as well as the audience! Bill is no stranger to music. In fact, he is the most schooled musician in the Hired Hands. His band mates often rely upon his expertise to help break down and analyze music while learning new material. Bill learned to play the trombone in his formative years, and eventually chose bass guitar as his instrument of choice. He is also the bassist for Kalamazoo favorite, the Seventh Son Blues Band. Many moons ago, he also played regularly with another local Blues band, Black Cat Bone. Mr. Hughes has also been known to dip his toes into the Rock, Country and Surf genres too. This versatility makes him a perfect fit for Hired Hands. Tim quit the drums over a humiliating experience with his middle school band teacher. At the time, dropping out of band seemed like a superb act of defiance. However, Tim spent the better part of his next 25 years regretting that decision. In 2000, his oldest son – then a middle schooler and accomplished drummer himself – invited Dad to attend a Summer-long, world percussion workshop. The experience turned out to be a true awakening for Tim, re-introducing him to art of drumming but, this time, with bongos, congas and other hand-played percussion instruments with exotic names. He joined his church band as an auxiliary percussionist, then went on to play with 2nd Shift, a Kalamazoo-based Classic Rock cover band. 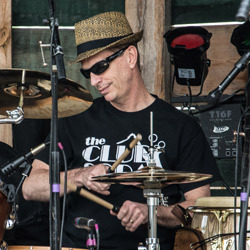 Upon joining the Hired Hands in 2010, Mr. C. decided it was time to stand up to that old band teacher, and re-acquaint himself with the drum kit. Nice.